Your state is unprotected: applies to all Avast Antivirus versions. Your Firewall is turned off: applies to Avast Premier or Avast Internet Security only. If your Avast Antivirus is active and the issue persists, repair and update Avast Antivirus, or reinstall it, if necessary. Refer to the sections in this article for instructions. Restart your computer and check that the issue is resolved. If your system is still not protected or your firewall is still not working, try to reinstall Avast Antivirus. 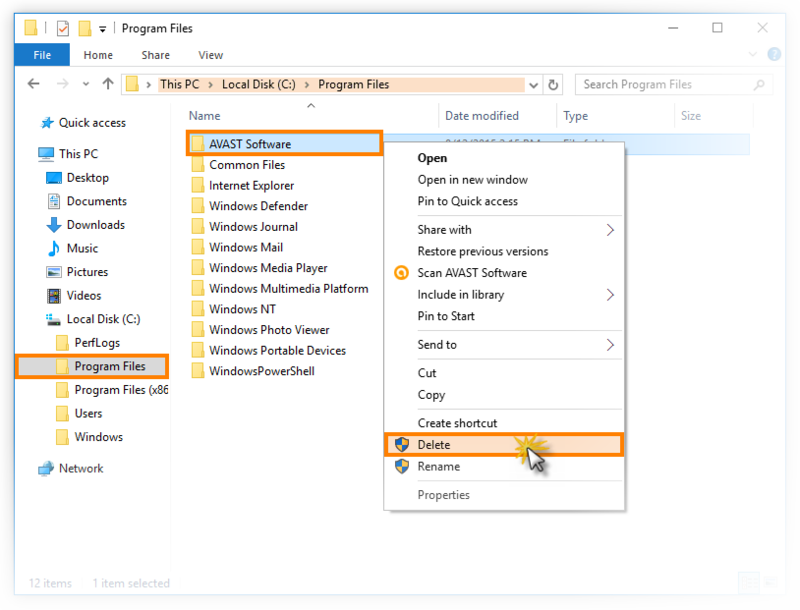 Restart your computer and ensure that no AVAST Software or ALWIL Software folder is located in C:\Program Files\. If you do find any of these folders in this location, delete them. Your installation of Avast Antivirus is now protected and, if applicable, your firewall is working.